Normal gingiva (Fig. 5-1)-exhibiting no fluid exudate or inflammation due to bacterial plaque-is pink and stippled. 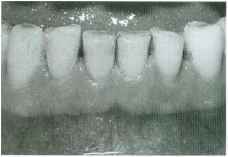 It varies in width from 1 to 9 mm and extends from the free margin of the gingiva to the alveolar mucosa. The gingivae and alveolar mucosa are separated by a demarcation called the mucogingival junction (MGJ), which marks the differentiation between stippled keratinized tissue and smooth, shiny mucosa; the latter contains more elastic fibers in its connective tissue. Apical to the MGJ, the alveolar mucosa then forms the vestibule and attaches to the muscles and fascia of the lips and cheeks. Fig. 5-2. Normal gingival structure and anatomic landmarks. 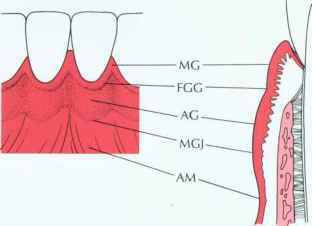 MG, Marginal gingiva; FGG, free gingival groove; AG, attached gingiva; MG], mucogingival junction; AM, alveolar mucosa. A V-shaped depression on the labial or buccal surface of the gingiva at or somewhat apical to the level of the epithelial attachment to the tooth is called the free gingival groove. It is not always readily apparent clinically but can be seen histologically and may serve as a reference point for dividing the free gingiva from the labial or buccal-attached gingiva. Which fibres of gingiva bind free gingiva to tooth?